Transfer wise asking for bank ID & PW? I've used transferwise a few times. Maybe 8. I tried it again the other day but got spooked when it asked for my bank ID and password. I was trying to pay from checking account like before. With that info someone could do anything with my money in that account. But i think my bank does require verification of new login devices. I don't think I was asked this before at transferwise? Do you okay with credit card? Depending on your U.S. bank Transferwise may use the method where they use a third party service to logon onto the bank account to fund the transfer....your bank has to use this third party service also for it to work. When you use this method Transferwise is taking a snapshot of some banking info like confirming the name on the bank account matches the name on your Transferwise account, there is enough money to fund the transfer, etc. Transferwise nor the third part service sees/stores your bank logon credentials. Right now a dozen or so large U.S. banks use this service. I read up on it before...the name of third party service/company....no longer have bookmarks on the info but will try to find it again. When I do a Transferwise transfer my bank, USAA, is one of those banks that use the third party service that Transferwise also uses and that's how I fund the transfer....I don't do it with a transfer link setup previously where trial deposits were used. I think it's Plaid that is the third party service/company that Transferwise uses to authorize the ACH transfer from your banking account. In a nutshell, Plaid enables applications to sync with their users' bank accounts to track and manage their budgets, and transfer funds. Plaid's API essentially serves as the connecter between banks and fintechs, and it's currently being used by several popular brands like Venmo, Gusto, TransferWise, Charity Water, Venmo, Gusto, TransferWise, Charity Water, Robinhood, and Level Money. For example, Robinhood, a stock-trading app, uses Plaid's ACH (automated clearing house) authentication to verify a user's account ownership, check balances, and facilitate the funds transfer. Similarly, Gusto uses Plaid's ACH functionality to power its payroll direct deposit service. Beyond ACH, other fintechs like Level Money are using Plaid to aggregate and clean data from the user's various bank accounts and adding helpful context to help them budget and manage their money. 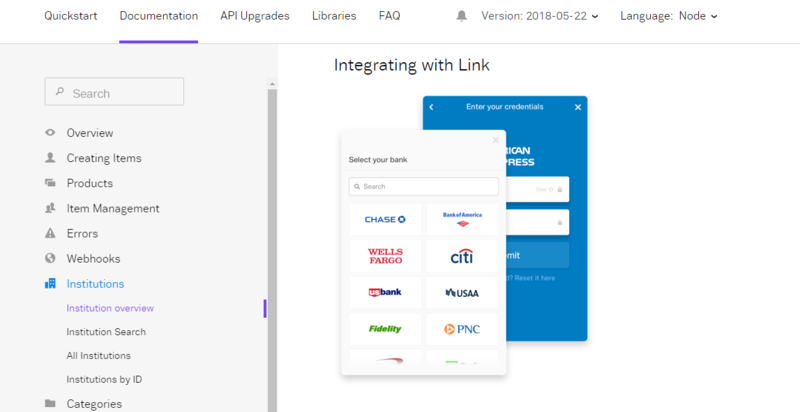 Below snapshot is from a Plaid webpage talking about use of their API to interface with financial institutions to accomplish some financial task like maybe accomplishing a transfer....like maybe transfer from your bank to Transferwise. Don't sweat it if Transferwise requires you to logon to your U.S. bank account "within the Transferwise webpage" to accomplish the ACH transfer. I expect they are adding more banks all the time that use the Plaid API versus using the old method of trail deposits. And don't be surprised doing the bank logon that your bank asks for some more verification beyond what they normally ask when you logon directly via your bank's website versus through the Transferwise webpage. You bank may ask a security Q&A.....like an Answer to a security Question(s) you setup earlier on your bank's ibanking. That's occurring because your bank is sensing your are logging on via a third party API....an API your bank supports but your bank just wants to take extra precaution during this logon....that's one reason they had you setup those security Q&As before. Technology marches on. Plaid "API"...maybe you are thinking what is an API? A couple of brief YouTube videos to explain what an API is. Wire transfer, debit or credit card. Wire transfer costs additional 30 USD. Bank debit is when they want my password. They say it's encrypted and no one sees or stores it. But with ID and PW I can move money from savings to checking and transfer or pay anyone. Just doesn't feel safe. I used credit card. When I pay my other bills they don't ask for password??? yes transferwise wanted my Wells Fargo Bank user name and password. I understand what they need it for but I was like NO FRICKIN' WAY. Up to you, but the use of such APIs is becoming more and more common by big and small financial companies/banks/credit unions. Yes, they don't ask for your banking credentials when doing a wire transfer because it's not Transferwise reaching out to get the money since you didn't authorized them to do so. Instead, you must initiate the wire transfer from your bank which will most likely come with at a nice little wire fee of around $20 charged by your bank. 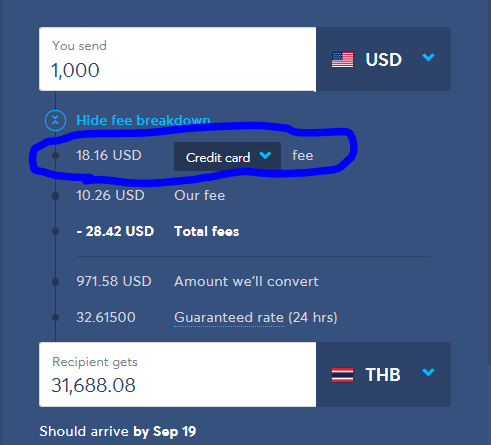 However, using a credit card to fund the transfer will be pricey....on a $1000 transfer Transferwise will charge a credit card fee of $18.16 plus your credit card company will charge a cash advance fee which will probably be 3% and will also start charging interest immediately. i used transfer wise today and since credit card fees are up I used back transfer. I did not get the request for my bank account login name and password like I did that last time when I posted this. Was that a phishing thing? or have they changed things.. I did send in a note to complain. and used a credit card instead. Assuming your using USD to fund the transfer Is your bank on their list which can use the log-in method? If not, you don't get the request....instead you must do the transfer link setup thing with trial deposits if your first time. And since you said you did get the login request before but not this time, if you skip over that step where you can pick one of the banks that use the login method then you end up needing to use the other ACH Debit method where you use a funding link you previously setup via the trial deposits method....or if you never setup one up previously, then you would have to go thru that setup process for the first time using trial deposits. Summary: you may have clicked the wrong buttons during the funding part. Or your bank is no longer on the Transferwise list that can use the login method....can only use the method which requires setup of a funding link via trial deposits. exactly, i felt the same way, when i just opened a transferwise acct and got the same request--your own bank, i think, would freak about you providing your acct and pw to some outside source--they, transferwise, swears the info is encrypted and no one sees it, etc--but think to all the major corps in the US, even Paypal i think, who have lost customer data. My understanding is that TransferWise uses a so called trusted third party that is a known entity to banks to do the ACH transfer from your bank and that TransferWise never sees your username and password. I use my Schwab Bank account for transfers and the money seems to arrive in my BBL account before it is withdrawn by ACH from my Schwab account. Typically if I start the transfer at noon PST it arrives in in my BBL account by midnight PST. The Schwab online web pages don’t show the transfer out of my account for 1 or 2 days or even longer if over a weekend but do show that it was to TransferWise.